The McDaniel College theater department has just finished its run of the Fall 2017 play: Tennessee Williams’ “A Streetcar Named Desire,” directed by Professor Gené Fouché. The show ran from Oct. 4-7, 2017, on the WMC Alumni Hall mainstage, and performances lasted about 2.5 hours, with a brief intermission between the second and third acts. The cast was comprised of Brian Bowen, Torreke Evans, Andrew Frascella, Jonathan Halberstam, Kiah Hyman, Valerie Lamb, Ben Michaels, Mandy Quarantillo, Brandon Richards, Megan Smith, Alex Tolle, and Patsy Zetkulic. Many other McDaniel students were also involved in behind-the-scenes work with props, sets, lights, sound, etc. 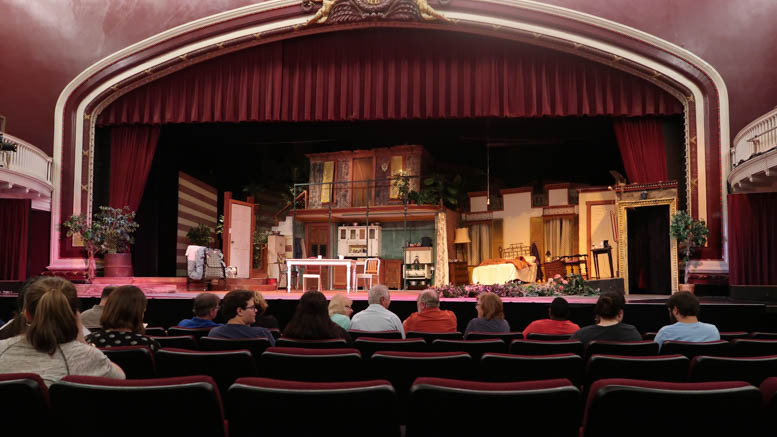 “Streetcar” follows the lives of Stanley (Bowen) and Stella Kowalski (Tolle), a recently-married couple living in New Orleans, when Stella’s sister Blanche Dubois (Smith), a former school teacher with a troubled past, comes to live with them. Her arrival turns the French Quarter upside down, and the tension between the characters rises more and more as the months pass. Stanley and Blanche can’t stand one another, as he thinks she is rude and entitled, while she thinks he is boorish and uncouth. Stanley and Stella’s relationship begins to degrade as their opinions of Blanche drives a wedge between them. This cannot even be saved by their expectation of a new child. Blanche also attempts to start a romance with Stanley’s friend Mitch (Michaels), but their relationship ends when he learns that she has been lying about her age and her past, and is haunted by her husband’s suicide. By the final scene, Blanche has suffered a psychotic break due to both Stanley’s violence and Stella and Mitch’s indifference towards her. Stella and Stanley have Blanche taken away to mental hospital, and she, no longer of her right mind, utters the famous line, “I have always depended upon the kindness of strangers,” as the play comes to an end. The theater department is currently rehearsing the musical “Carrie,” directed by Josh Selzer, which will be performed Nov. 15-18, 2017.